Caption: Donna Hope, Vice President of Nassau Community College Federation of Teachers. Photo by Andrew Watson. Hope wondered: What about her work, her research, her commitment, and her previous union officer positions? But NYSUT is working to change that narrative, and during this past weekend’s annual Community College Conference, it held a session focusing on increasing the role of women in leadership roles. 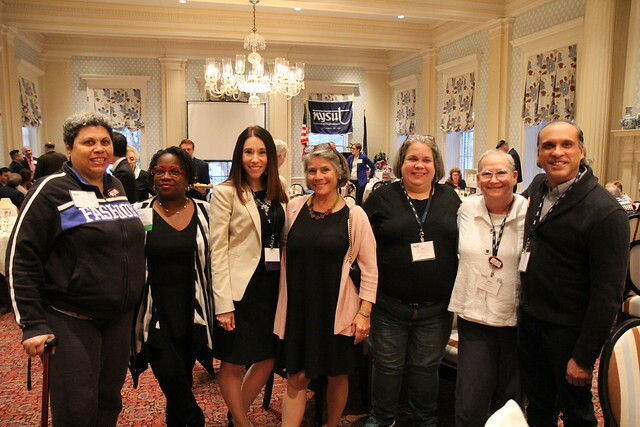 Women make up 76 percent of NYSUT membership, and the statewide organization has been working to make women’s issues a priority and encourage more females to become active within their locals. The union also has created a Women’s Committee, of which Hope became a member. Its next meeting will be held in November. There’s long existed a dearth of women in leadership roles, and according to community college workshop leaders Roberta Elins, president of the United College Employees of the Fashion Institute of Technology, and Bethany Gizzi, president of Monroe Community College Faculty Association, the reasons are wide ranging. Learn more about the work of NYSUT's Women's Committee at www.nysut.org/women. Check out our tips for starting a women's committee in your local union. Join the conversation online! Follow the Women's Committee on Twitter and join the new Facebook group. Family and work demands have kept some women from running for leadership positions, for instance, while a general lack of support for women candidates also has had an adverse impact on numbers. Elins and Gizzi said one way to effect change is by prioritizing women’s issues at the bargaining table. Elins said UCE was able to successfully increase the number of distance education courses that could be taught by faculty, which she said helps women who have young families. Gizzi, meanwhile, noted that at MCC there is now a salary equity provision in the contract for women and people of color, both of whom in the past have seen their pay lag. While it is a goal of the NYSUT Women’s Committee to involve more women in leadership roles, it also aims to educate female members about the work of the union; highlight women-specific issues, including inequalities in pay, health care and education; and encourage more locals to develop in-house women’s committees. At the Community College Conference workshop, a roomful of 30 union members, including four men, were asked whether their local had its own women’s committee. No one raised their hand in the affirmative. Elins and Gizzi explained that some roadblocks to women moving forward as leaders are expectations about appearance; judgment of women for their family choices; assuming women become leaders only because other women support them; believing that union presidents should be men; and believing women are too emotional. “It bothers me, being quieted as a woman, as an artist, in my department,” said Ranelle Wolf, an adjunct with the Faculty Association of Suffolk Community College, noting the one full-time position in her department is a man and all the adjuncts are women. Like many adjuncts, Wolf struggles to find more work, so she tapped into a passion, and after research and “excavation,” she is now presenting public library talks about the history of women in art and how they empowered themselves. A first-timer to the community college conference, she said she is “hungry” for more collaboration and empowerment for women. Elins and Gizzi urged their colleagues from around the state to provide support, training, mentoring and role models for female leadership. They also spoke of the need to highlight the importance of women’s contributions within their local union and the union movement as a whole.